If there was ever a time to be impressed with a steak restaurant, then this would be it, my meat-eating friends. The 2nd Hong Kong restaurant-child of Mario Batali and Joe Bastianich, in conjunction with the ever-expanding Dining Concepts Group (who seem to be aiming for a monopoly on steak in Hong Kong), attention to detail is definitely the motto for this restaurant. Crisp white linens, leather paneled chairs, beautiful wooden flooring, brass lighting. Everything is quite masculine, yet the decor is welcoming and appealing to all. What impressed me – the Christofle cutlery and engraved Laguiole knives! It really seems as if no expense was spared, and not only was the food rich, but so was the eating experience. 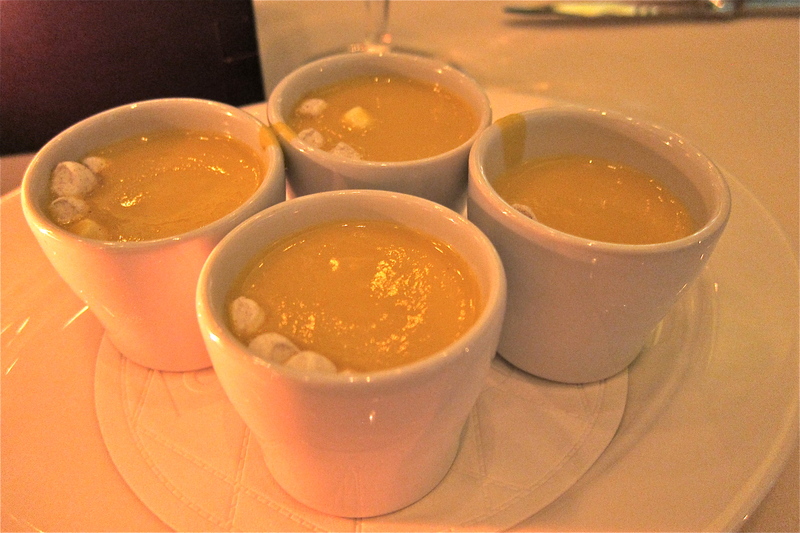 Before out starters arrived, we were served an amuse bouche of butternut squash soup. It was comforting albeit slightly unsophisticated, and a touch on the sweet side. I wouldn’t turn my nose up at it, but one of those in our party didn’t finish it. It wasn’t a good indicator of the meal to come, certainly. 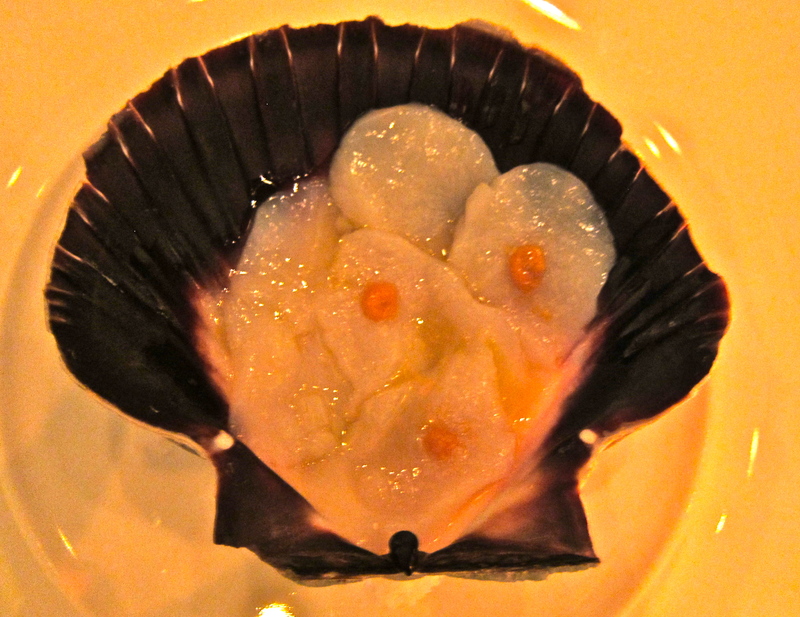 We started with live scallops with a wonderful citrusy oil, a sophisticated dish that was beautifully presented. I could always do with more scallop though! Our waiter that evening was extremely knowledgeable about the menu, and although there was a big discrepancy between some of the staff, many of them looked as if they had been very well trained on the menu, the ingredients and service to a higher level in general. Hats off to Batali/Bastianich for making service a priority, it’s hard to come by in Hong Kong. Our waiter was highly informative about this dish! “The calamari is flash fried for 39 seconds, no more, no less. 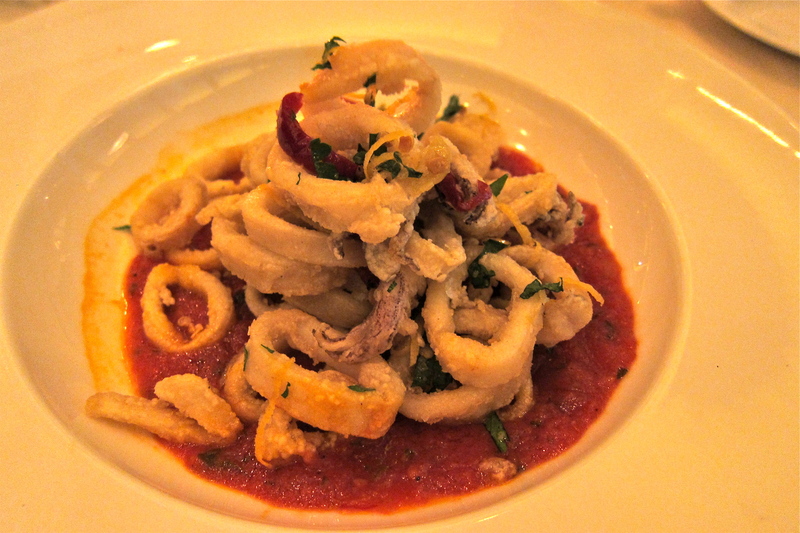 Our calamari isn’t soggy, it’s the crispiest calamari you will ever taste, and the house-made chili sauce is very special.” Well, need I say more? With descriptions like that, you have to order it. Firstly, he was right – the calamari was super crispy, but the rings were quite small, so for me they were a bit too dry. I prefer to sink my teeth into soft and tender squid rather than just very well-fried batter. The sauce, however, was wonderful, piquant, sweet, sour and warm. The chili peppers deserve special mention. 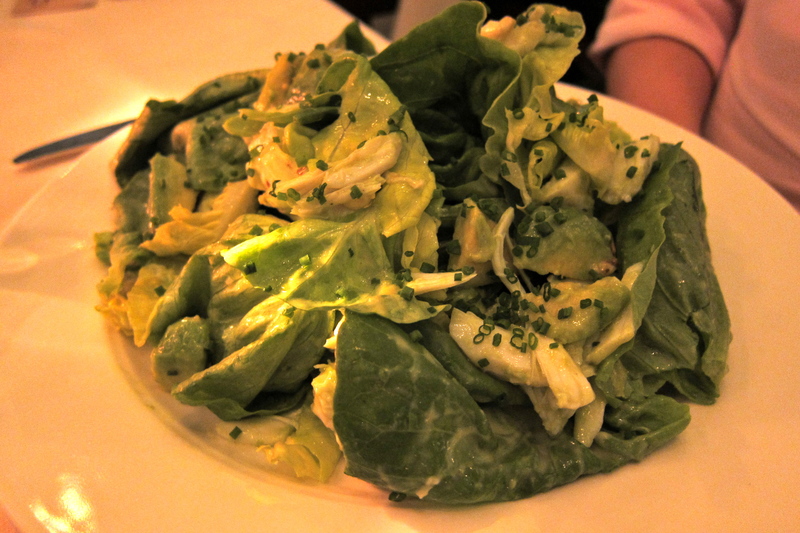 I didn’t try the crab salad, but our dining companion SA had been looking forward to ordering it all week! All the elements naturally work together in a salad, and if you get your hands on some jumbo lump crab meat, I’m sure this would be quite easy to recreate at home! All in all, the starters section of the menu was very comprehensive and thoughtful, with raw appetizer, cold appetizer and hot appetizer selections. Now for the plat de résistance – the Dry-Aged Fiorentina Steak! 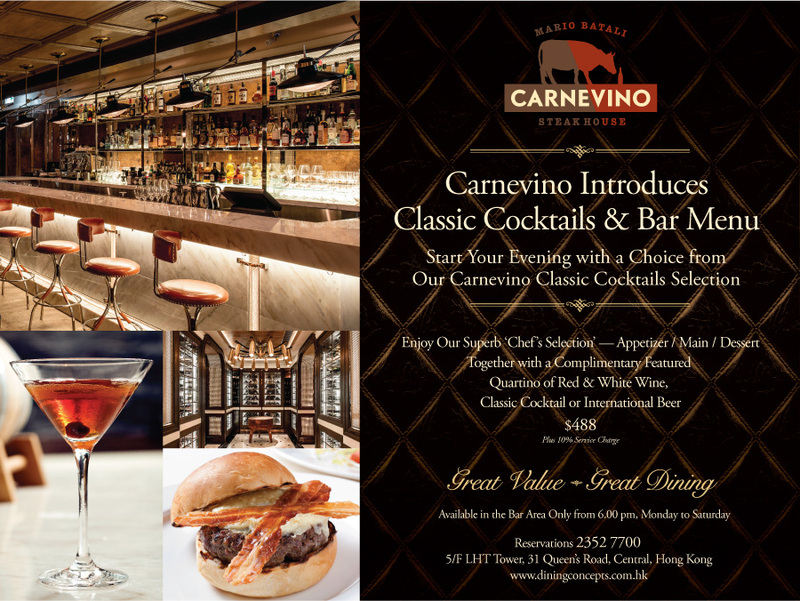 Again in great detail, our waiter informed us that Carnevino have their own meat storage facility in Kowloon, where the meat is aged for a minimum of 70 days at 84% humidity with constant air flow. The bone-in steaks are from Australian cows, because there are restrictions against importing US bone-in meat. That was a plus for me, after watching how US cattle are reared in the documentary Food Inc., I try to avoid eating US meat if possible. The traditional bistecca alla Fiorentina, popular in Tuscan cuisine, is basically a T-bone steak, cut to 3 finger thickness, seasoned with salt and black pepper, grilled 3-5 minutes each side, and served pretty rare. At the time of dining, I found it a bit odd that the waitress came to our table with a bottle of olive oil, ready to pour it over our steak! I later found out that the Fiorentina is traditionally seasoned with olive oil, but strictly after cooking. 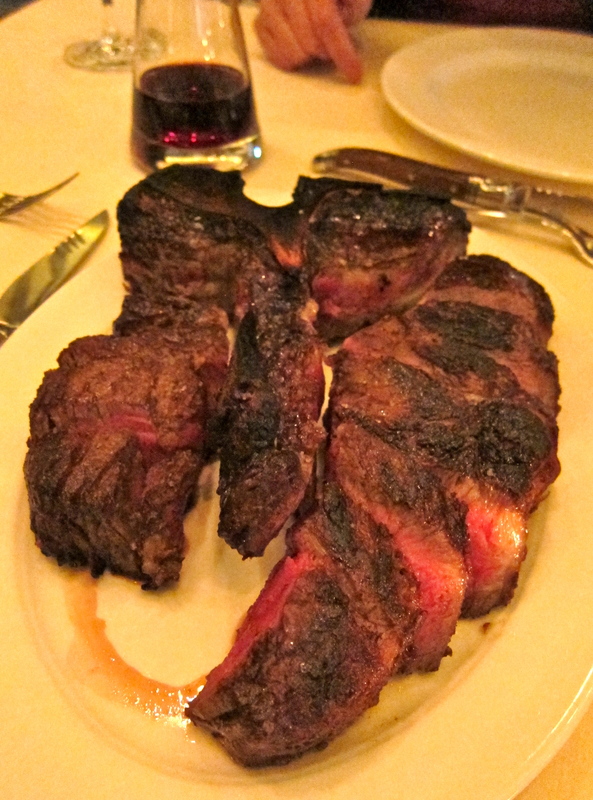 A T-bone steak contains meat from two different cuts of beef – the filet (or tenderloin) on the left, and the New York Strip (or short loin) on the right. The tenderloin is leaner, whilst the short loin is more tender and marbled with fat. Whilst it was a tender, wonderful steak packed with flavour, at HK$1468 for the portion, one does hesitate to think if they really want to spend that much on a piece of meat, but it’s worth it to try it at least once! The pork chop was extremely well executed, and never being one to be a big fan of pork in restaurants, I was suitably impressed! It’s a difficult meat to cook to perfection, usually too well done, dry around the edges and needing a good sauce to provide some moisture. This pork chop was HUGE, beautifully cooked with a pink center, and juicy from the crust to the core, no sauce or seasoning needed. A truly wonderful piece of piggy! Be aware, this can easily be shared between two, even two guys could make a meal out of this with sides. 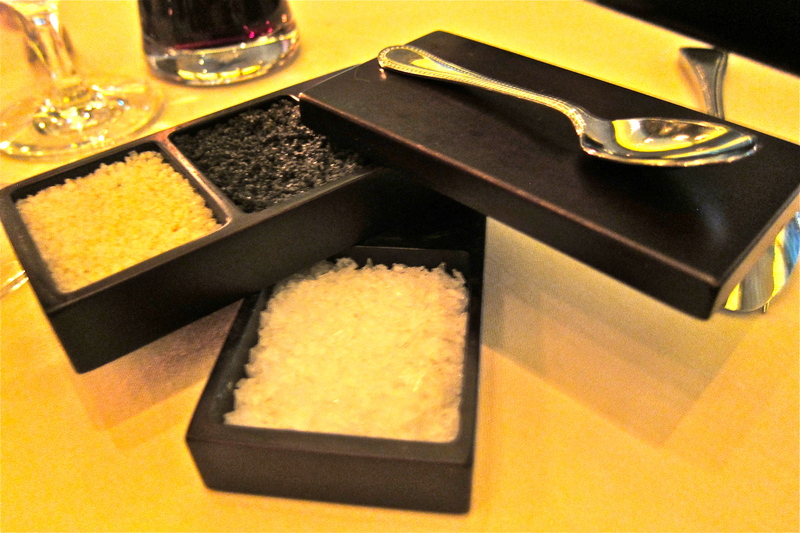 If you feel the need for some seasoning, you are provided with a selection of salts: volcanic black salt, pink Himalayan salt, and your classic Moldon sea salt flakes. Now, this stuff was a heart attack in a cast-iron dish, but boy was it stratospherically awesome! As long as you don’t ask, you can remain blissfully unaware of how much fat you are eating – it’s one of the best potato side dishes I’ve ever had. 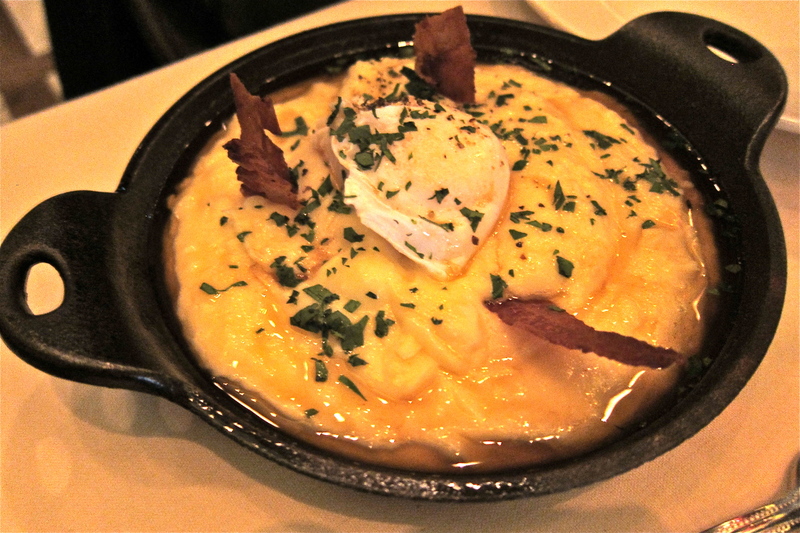 The duck egg really tied everything in together, and added the perfect richness to the dish. Or perhaps that richness was the butter? Or the mascapone? Or the pork jowl? Oh forget it, just order it and enjoy it,you only live once! None of the main meat dishes come with sides, so unless you just want to eat just meat, you’ll have to order something else from the very nice selection of Side Dishes. 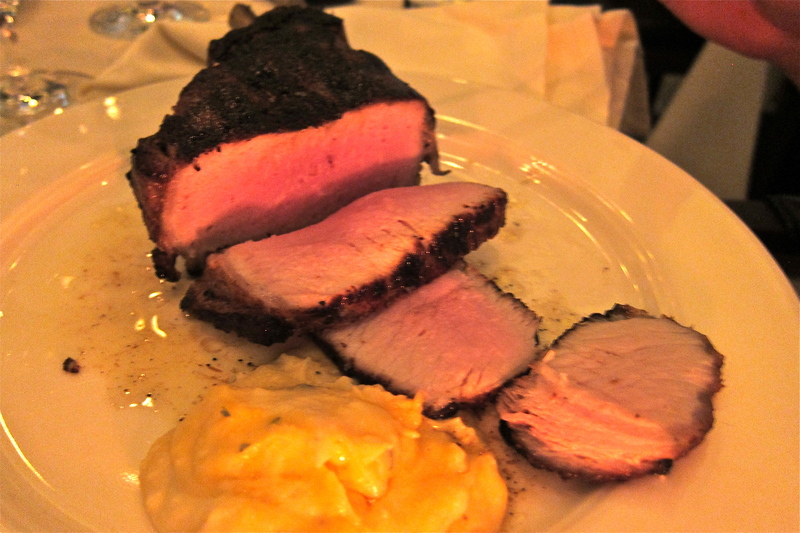 Carnevino is truly an experience for the meat-lover. At a minimum of around HK$600-800 for 3 courses excluding drinks, it’s far from being just another run of the mill steakhouse. They also offers a Bar Menu for dinner (HK$488 in the bar area only), as well as a Set Lunch which are great value for money. 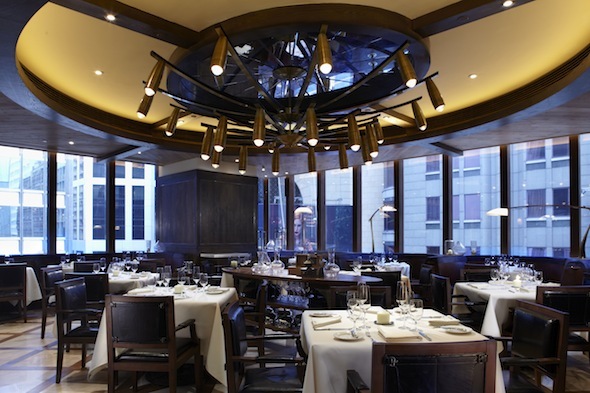 The Lunch Menu (HK$238) features some great dishes, with starters including the calamari and steak tartare, mains such as the Carnevino burger and Flat Iron Steak, with an option of dessert for an additional $HK58. I’ll definitely be going back for that lunch! The wine list is extensive and features a great selection of wines that go well with steak, although there aren’t many well-priced options. You can make reservations online to all Dining Concepts restaurants via their website, and they now even have an app you can download to view menus, check promotions and make reservations!